Paris restaurant appearance and high French cuisine as a whole in the minds of almost every tourist is associated primarily with expensive luxury establishments, with huge rooms and plenty of staff under the guidance of renowned chefs. 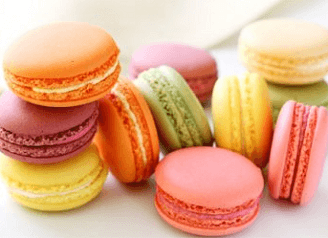 They receive international fame enjoyed popularity among gourmets from all over the world and are on everyone's lips. But smaller and inexpensive cafes unfairly left out of the field of view of the public, but because they define the unique look of the French capital: give it a subtle charm, make more comfortable and hospitable streets, all countries allow tourists to feel very much at home here. 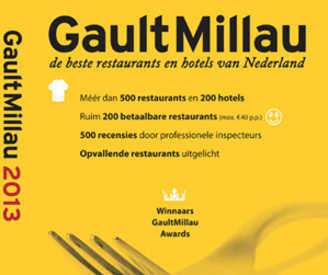 Reviews and ratings Parisian cafes and bars can be found in several famous food guides such as "Gault Millau", but there they are included in the total weight of the descriptions, though marked with a special sign (places where you can eat cheaply). But there is in France a totally unique in all indicators directory that specializes in surveys institutions this type. Meet the guide Le Pudlo (« Pudlo"), on which pages contain information only about the best small restaurants, bistros, fast food cafes, etc. In this edition you will find information about expensive and luxurious restaurants from around the world, only affordable prices and service cafe, however, are , in my opinion, is very worthy of a visit. By the way , the creator of the guide "Pudlo" editor and main judge - it is one and the same person - Gilles Pudlovski, and this is also an argument in the treasury of the uniqueness of this edition - it is almost entirely written by one person. 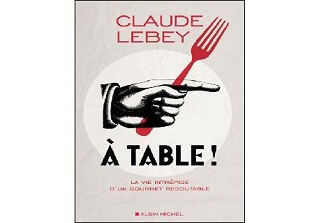 In addition, the scope of its activity is not limited to the release of " Pudlo," as he is known in France as early and as one of the most respected restaurant critics, writing your articles in the magazine Le Point. And he always has time to perfect . Directory Monsieur Pudlovski releases since 1990. " 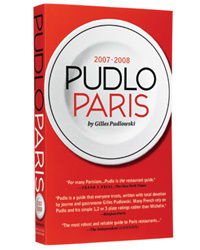 Pudlo" comes out once per year and holds a culinary establishments 7500 addresses collected from all over France. Paris list usually contains about 1,800 addresses. However, french look guide is not limited to Paris and surrounding areas: child Publishing emerging under the auspices of "Pudlo" illuminate and catering establishments of other places where the corresponding name and will show off on the cover - "Alsace ", "Strasbourg", "Cote d'Azur" " Monaco", " Corsica", "Luxembourg". Popularity guide foreign tourists became so high that its 17th edition for 2007-2008 was released in two languages: French and English, but the English translation was later brought some claims (for example, an unfortunate choice of foreign language synonyms to the words "great","luxury "and other errors). Then came the crisis and this initiative and remains at the experimental stage. But Monsieur Pudlovski not preclude the continuation of bilingual guides . will be a good assistant for those planning a leisurely and thoughtful self-guided walking on the streets of Paris with a visit to the most comfortable and affordable catering establishments and other places of interest. Pudlo - undoubtedly a candidate in the Guinness Book of restaurant guides , because all of his reviews (and their institutions only by Paris is more than 1,800 pieces) performed by a small team of experts - 4-5! And in charge of all the " great and terrible "Monsieur Pudlovski who personally proofreads, edits and verifies all materials . 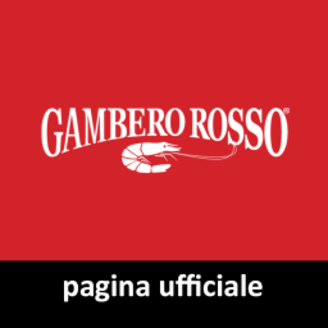 Of course, he personally visited some places during the year, and then sharing their experiences with our readers on the pages of the guide: provides detailed reviews of different cafes and restaurants, makes recommendations , where it is necessary to lovers of good wines and unusual desserts, etc. In addition to new facilities, expertise and old checks already "lit up" in Pudlo "address : Do not decreased the quality of service in them? 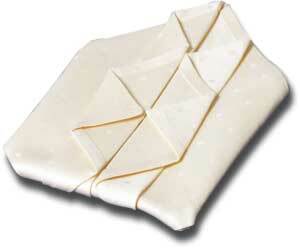 Do not become less tasty cuisine and more expensive? All these nuances and changes will immediately be entered into the registry defects, and in case of a sharp deterioration restaurant may well be "a candidate for the fly" from the rating guide. 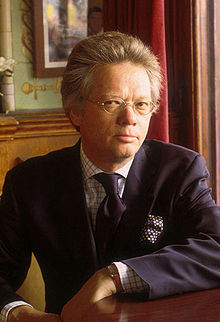 Sharp criticism in the reviews Pudlo could not be found , because ranking includes only the best places, but his comments on the case or a mark on the specifics of the institution or its "chips" will attend mandatory, because such things Monsieur Pudlovski as a professional with years of experience, notices immediately. But, of course, primarily evaluated kitchen facilities, and then exacting gaze criticism stops on the atmosphere, prices, service. Inner peace Pudlo though diverse, but strictly ordered: Monsieur Pudlovski care of their readers by distributing all covered in places by reference certain chapters, each of which corresponds to some Parisian district. In turn, each chapter has a clear structure: the first is rated gastronomic establishments, then provides an overview of each of them lined up in alphabetical order. Each such notice takes from ten to twenty term. 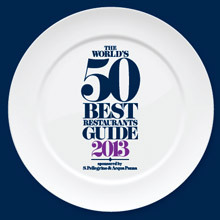 In the ranking takes into account first of all kitchen facilities, though the atmosphere, service level , democratic prices are also very important - and this is noted in the comments. Here are the tables that clearly show restaurants and rates them, and thus marked the place with good value for money. 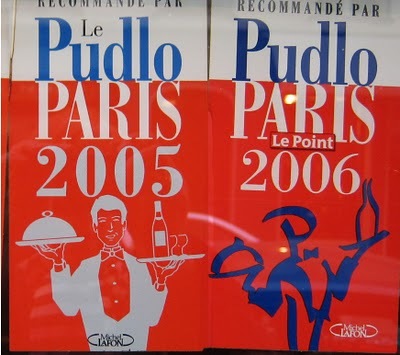 For example, in " Pudlo " for 2011 it was stated in 1639 establishments, of which Monsieur Pudlovski $ 21 personal favorite of gastronomic establishments, 93 - with the best value for money service and 144 places where you can eat for 30 euros (or even less). There were also marked restaurants with a terrace or even own garden, outdoor open space running after 23.00 with a special children's menus, etc. Special "chip" directory is a special section for fans to cook for themselves and for tourists who want to take away as a souvenir from Paris some culinary wonder. Especially for this address are collected here and coordinates shops selling delicacies and the highest quality products. In " Pudlo " in 2011 they were given 529 pieces. In the annotation to each room guide states that interesting and useful information awaits the reader inside. 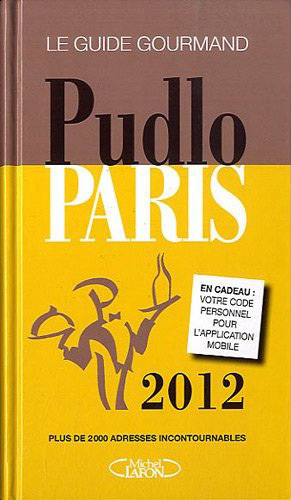 For example, on the flyleaf "Pudlo 2011" reported that it contained about 2,400 addresses gastronomic establishments that are selected "team of passionate foodies" to help everyone fully "taste Paris" and enjoy its unique taste, " Would you like to enjoy a great minced meat , calf's head , the usual roast beef or dessert that you might have tried in early childhood? Pudlo Paris follow the instructions and choose only the best bistros and brasseries . We will take you to places that have their own history and incomparable taste. " 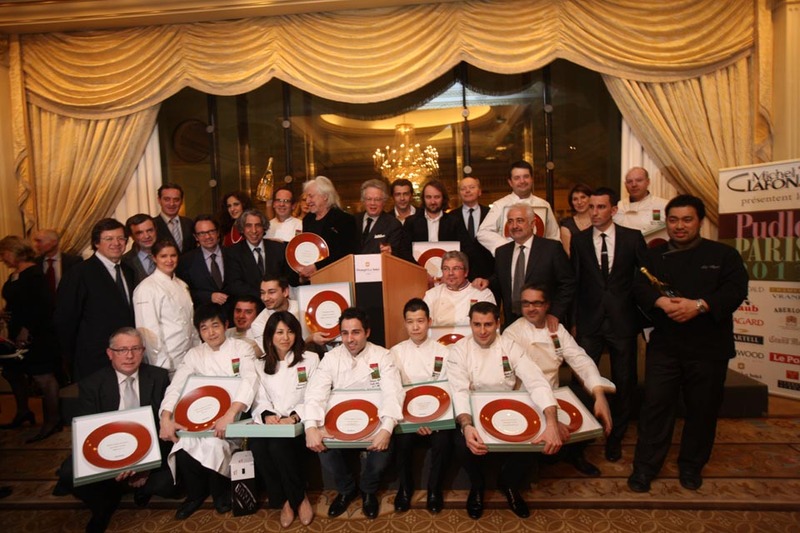 Emphasizes that : "Among the famous chefs, presented in the book: Paul Bocuse, Alain Ducasse and Guy Savoy, and each of them has presented the reader with a prescription for use in the home kitchen." Although these words may seem too presumptuous, " Pudlo " hard to fault in raptures of self promotion because everything written here - the truth. Externally Guide is a publication often with red or red- black cover, hardcover format 28.2 x 24 x 2.4 cm Usually there are about 200-250 pages Price about 9-10 euros. 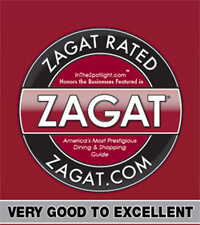 The rating scale is quite common in the guide - three-point . However, following the culinary tradition and to be different from the same "Michelin" as the main character for its rating Monsieur Pudlovski chosen plate. The best places get three beautiful and honorable plates , and this especially makes sense if we remember that the critics point out first of all, dignity cuisine restaurant or cafe. 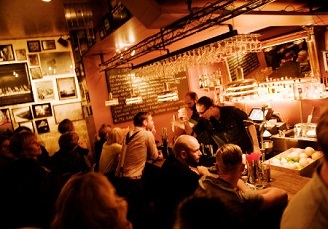 And in the "best" Pudlo could easily write the usual Parisian bistro from the industrial quarter, provided that the kitchen there is beyond praise, along with a luxurious restaurant in classic style ( with white columns and gilded chandeliers ) and a small army of staff. To further inform readers put an icon " knife and fork ", which tells about the merits of places not associated with the menu. In general, the rating scale is as follows: "simple" - one star and one knife and fork, " cozy " - one star and two knife with a fork, "very comfortable " - two-star and three knife with a fork, "luxury" - two star and four knives with a fork, "super Deluxe" - three stars and five knives with forks. Meet here and special characters, such as a source of pride and Monsieur Pudlovskii his own "invention" - broken plate. This sign indicate fashionable places in the season, which claims on luxury critic considers unfounded and ironically notes that they need to attend, acting only at your own risk. Another interesting character - an arch that marks the places located in the buildings of architectural monuments or buildings of historical importance. Thus, tourists can simultaneously read and gastronomic and historical and cultural sights of Paris. Monsieur Pudlovski - personality is extremely versatile and energetic. As a restaurant critic, he collaborates with the French weekly Le Point and is one of the most respected and honored its journalists. In addition, it periodically writes materials for specialized magazines Saveurs and Bon Voyage, illuminating the history of French regional culinary traditions, as well as " lit up" as the author of two cookbooks: "The best cookbooks of France" and "Great women chefs of Europe." But that's not all! Annually, the creator of Pyudlo personally presents award named after himself better restaurateur, best female chef, pastry chef better, the best producers of meat, cheese , etc. And he made ​​no intention to stop planning, in particular, to resume production of the English version of the guide. By the way, released in 2007 the 17th issue of Pyudlo in English , despite the errors of translation, has become very popular in the U.S. because Americans just are adherents of small establishments ( including fast food ) with affordable prices. And this guide has become a very valuable asset to any American tourist, who wanted to visit Paris. Monsieur Pudlovski also is a frequent and welcome guest okolokulinarnyh various activities, such as he participated as guests of honor at the Festival of Israeli cooking "Yarden vintage 2010" and oversaw the 2012 exhibition Les Seductions du palais in Paris Museum Branly, dedicated kitchen imperial China, Paris Chinatown and the best Chinese restaurants of the French capital. 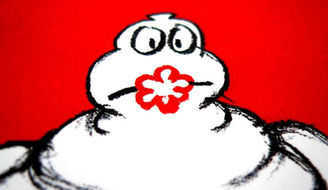 Monsieur pudlovski also leads his own blog on the Internet - www.gillespudlowski.com, which share their personal impressions of the various events in the world of haute cuisine, talks about his acquaintances with famous chefs and just puts a lot of interesting information.